A particular evolution of non destructive testing in the last twenty years is that aircraft manufacturers have to fulfil the inspection of the materials they transform to make parts that can fly. The inspection of next generation aircrafts is a great challenge due to the fast increasing number of parts made of various materials with complex geometries. These new components are the produce of new manufacturing technologies such as super plastic forming and diffusion bonding of titanium and aluminium metal sheets (SPFDB), resin transfer moulding (RTM) and others. To tackle on one side the large number of composite parts, and on the other side the complexity of these new structures Dassault Aviation has invested in new inspection techniques, Acoustical Interferometry, Acoustical Microscopy and Laser Based Ultrasounds, the latter being developed in co-operation with Aerospatiale. Dassault Aviation is also investigating some acoustical techniques which are pearcing through, such as Airborne Ultrasonic and Acousto-Ultrasonic. The outcome of certain new manufacturing technologies such as RTM favours the development of process control which should reduce inspection requirements at the end of the line. 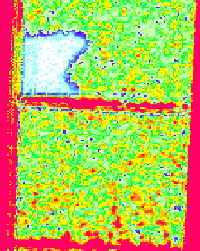 Based on acoustical interferometry techniques which have been applied in medical and industrial applications, the Battelle-Northwest (Richland, USA) has developed the "RTUIS" acronym for Real Time Ultrasonic Imaging System. After several years of evaluation and optimisation in co-operation with the Battelle-Northwest, Dassault Aviation is using the RTUIS for the inspection of some composite parts of the new fighter RAFALE (Ref. 1). RTUIS is an ultrasonic camera (see Figure 1). It uses a large plane-wave-generating ultrasonic transducer for sonic illumination, and then uses a liquid surface holography to convert the sonic picture into a surface wave pattern that is interpreted as a normal optical image by a television system. A laser operates as a flash system to capture the image of diffraction at successive moments in time at a video rate frame of 50 to 60 per second. Specimens to be inspected are placed in front of a large (100 mm diameter) ultrasonic transducer. The generator of ultrasounds operates at discrete frequencies from 3 to 5 MHz in a tone burst mode creating wave trains of 100 microsecond duration. These wave trains pass through the object and interact with materials along the path of propagation, energy is scattered, diffracted and absorbed in a manner characteristic and representative of the material continuity. Ultrasonic lenses, made of solids and liquids are used to collect this energy and refocus it on a liquid detector surface. 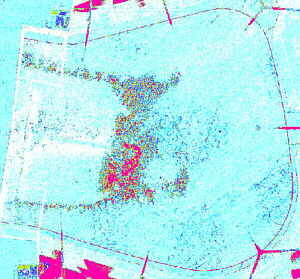 The detector is aligned with the image plane, where film would be in an optical camera. Ultrasounds from an other identical transducer are mixed with the ultrasonic beam from the object, this creates an interference pattern which is impressed upon the liquid surface of the detector becoming a diffraction grating. When this grating is illuminated with a pulse of light from a laser, the diffracted intensity is proportional to the intensity of the ultrasonic beam transmitted through the object. Thus, the liquid surface serves to transform an image formed by acoustic energy into a light image which can readily be displayed using a close-circuit video system. better tolerance for beam incidence (+- 7°) enabling the inspection of fairly complex geometry part with easy positioning. Applications cover a wide range of parts ranging from spars and stiffeners with radius, curved panels, to the self stiffened composite boxes of elevon (see Figure 2). For a few years, a large amount of work has been carried out on Ultrasounds generated by pulsed laser, particularly in metallic materials such as aluminium. 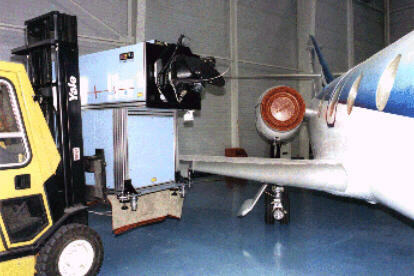 The adaptation of Laser ultrasonic to non metallic materials such as Composites has been undertaken leading to the acquisition in common by Aerospatiale and Dassault Aviation of a unique industrial prototype "LUIS", acronym for Laser Ultrasonic Inspection System, based on the research work done by "Institut des Matériaux Industriels" (IMI) in Montreal (Ref.2), it has been developed and it is commercialised by the Canadian company UltraOptec. 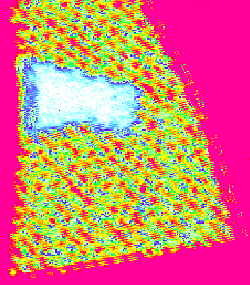 When a low power laser pulse strikes a solid surface, one part of the incident energy is reflected and the other part is absorbed and converted into heat. The fast temperature rise localised near the surface produces an elastic stress field due to the thermal expansion of the material which if it remains in an elastic state constitutes the thermoelastic source. These transient stresses give birth to acoustic waves in different directions, corresponding to longitudinal, shear and surface waves those magnitudes depend on the stimulation regime, thermoelastic or ablation, the material thermal and optical characteristics, and the generation laser beam parameters, wavelength, shape and pulse duration. 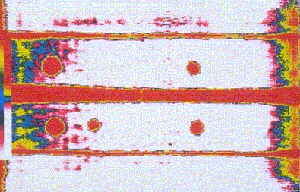 Detection of the ultrasonic waves in transmission or reflection is favourably provided by interferometric methods based on Michelson or Fabry-Pérot interferometers; the latter one which is integrated in the LUIS used the Doppler effect which has been made insensitive to part vibrations. proven sensitivity for a wide range of materials. Composite materials parts of complex geometry, radoms, spars, wings (see Figure 4) and fuselage panels have been easily inspected with minimum positioning and handling and at a speed of inspection already comparable to a conventional C-scan system on flat panels (2m² per hour) (Ref. 3). A very good potential has been demonstrated for corrosion detection, even with a laser source (CO²) optimised for CFRP. The production of heavily loaded flying SPFDB components for Dassault Aviation's fighters has required quantitative characterisation of the diffusion bonds. The particular problems which arise in SPFDB processing of titanium alloys at the development stage can induced defects at the bond-line which take the form of voids of different sizes, with a gap ranging from the intimate contact disbond up to 20 µm. The inspection requires the determination of the percentage of bonded grain (per unity of surface), rather than the search for isolated defect (Ref.4). Ultrasonic techniques appeared to have the greatest potential for defects detection and sizing in diffusion bonds. Unfortunately the smallest defect size can be much less than the wavelengths of conventional ultrasounds therefore it has led us to look for higher frequency equipments from 30 MHz up to 100 MHz, point focusing transducers, signal processing techniques and high resolution mechanical scanning rigs. Specific transducers are used, the piezoelectric sensitive element is made either of quartz or PVDF polymer. The use of quartz requires adaptive delay-lines but the sensitivity is good (-30 dB), the main disadvantage is the reflection echoes in the delay-line structure (silica) generating noise. PVDF transducers do not have delay-line but their sensitivity is poor (-70 dB). C-SCANS are obtained with a 100 MHz transducer having a 8 mm focal length in water, and are mapped with acquisition steps ranging from 0.01 mm to 0.1 mm (see Figures 6 &7). In order to determine the detection limit regarding to flaws length, we have correlated the ultrasonic C-SCAN cartographies with micrographies. At these high frequencies, the roughness influence is essential for the sensitivity and the correlations show that beyond 20 µm (length), the detection is not systematic, and even impossible with current techniques (see Figure 5). The drawbacks were related to its low sensitivity and spatial resolution. Work undertaken by the University of Strathclyde (UK) within a BRITE EURAM program (Ref.5) to improve the technique has been aimed at the development of ultrasonic transducer technologies, in particular composite and electrostatic. The former technology provides robust narrow bandwidth transducers with good sensitivity, the latter one offers much wider bandwidth probes but less robust and with lower sensitivity. For low frequency applications less than 1 MHz (detection of delamination, debonding,...) air coupled ultrasounds are now at the edge of the water squirter technique performances (see Figures 8 & 9), they can already be considered as an alternative for the different fields of inspection, and with very good prospect by implementing multielement arrays. One non-destructive evaluation technique that lends itself to rapid part inspection is Acousto-Ultrasonic (AU). This seems particularly interesting and may be the unique solution for thick and geometrically complex parts or structures as well as for high volume industrial applications requiring rapid part throughput (Ref 6). A series of ultrasonic waveforms are emitted and acquired using a multiple probe configuration which surrounds the structure. Either a cradle assembly of probes can be used for manufactured parts or in-service inspection, but a strong potential lies in the process control of RTM for which the integration of the probes can be done at once in the mould. Digital signal processing (Fast Fourier Transform) is used to extract pertinent waveform discriminators, and pattern recognition theory is then applied to classify the respective features based upon the results obtained from a learning set of signals taken from an assortment of "good" and "bad" structures. During an Acousto-Ultasonic test cycle, externally generated stress waves are propagated through the part which interact with all of the various material constituents. Because AU is a volumetric test, the data produced contains information concerning the overall material health. The multiple probe configuration requires optimisation with wave propagation modelling, transducer sender/receiver pairings usually include classical same side probe configurations as well as opposite side and transverse one's. Most of the NDT techniques are for the inspection of the manufactured parts or when used in service it generally means that the operation of the vehicle must be interrupted, this interruption represents increased downtime, labour and cost. The outcome of certain new manufacturing technologies such as RTM favours the development of process control which would reduce inspection requirements at the end of the line. In situ cure monitoring is being developed to increase quality and reproducibility for which a lot of techniques have been investigated such as fibre optic sensors with spectrometry methods, acoustic wave guides, ultrasounds, infrared thermography, microwaves and dielectric methods. These sensors are either embedded in the material, integrated in the mould or outside the processing system. These methods enable a process control by either tracking the reduction in resin viscosity, or monitoring the consolidation, or directly determining the degree of cure, but material integrity can also be achieved therefore avoiding the need for a final inspection. Ultrasounds have a very strong potential because attenuation and velocities of the sound waves are related to increasing viscosity of the resin, gelification and hardening (Ref. 7). 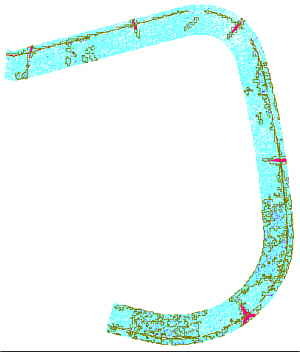 In order to fulfil the inspection requirements of the parts manufactured and maintained, Dassault Aviation has invested in new inspection techniques, in particular Acoustical Interferometry, Acoustical Microscopy and Laser Based Ultrasonics which were amongst the most promising methods within the several NDT-NDE one's emerging and presented here. Each method of course has its own range of applications, unfortunately not one cover the whole required spectrum, and more than two different methods would be necessary if one would want to do it all the most efficient way; nevertheless most current problems and needs can be fulfilled. The main issue with the choice of these techniques is the low production rate of the components to be inspected in the European aircraft and aerospace industries, which do not facilitate their integration. Technical issues for Laser Ultrasonic, in terms of performances and integration will result from the evolving nature of technology. Air coupled ultrasound is already an alternative for contactless inspection and Acousto-ultrasonics could be the answer for the more complex parts which will be manufactured for the next generation of aircrafts. A strong alternative associated with the development of new manufacturing technologies such as RTM is Process Control which should enable cure monitoring and material integrity assessment, thus suppressing final non destructive inspection. The author wishes to acknowledge the support by funding from the STPA (French Ministry of Defence) and from the European Community, as well as the work provided by A. LIOT, F. THEVENOT, M. DESSENDRE and H. VOILLAUME. A. DURRUTY, G. LEFEBVRE, J. BERNARDI, "New Acoustic Holography applied to Composite materials", 6th European Conference on Non Destructive Testing, Nice, France, October 24-28, 1994. J.P. MONCHALIN, Review of Progress in Quantitative Non Destructive Evaluation, Vol.12, edited by D.O. Thompson and DE. Chimenti, Plenum Press, 1993. O. PETILLON, J.-P. DUPUIS , H. VOILLAUME, H. TRÉTOUT, "Laser Ultrasonics: A non-contacting NDT system", Review of Progress in Quantitative Non Destructive Evaluation, Vol.14A, edited by D.O. Thompson and DE. Chimenti, Plenum Press, 1994. F. THEVENOT, A. LIOT, H. TRÉTOUT, "Scanning Acoustic Microscopy for Quantitative Analysis of SuperPlastic Forming Diffusion Bonding of Titanium Aerospace Components", 6th European Conference on Non Destructive Testing, Nice, France, October 24-28, 1994. G. HAYWARD and A. GACHAGAN, "An evaluation of 1-3 connectivity composite transducers for air coupled applications", Journal of the Acoustic Society of America, 99(4), April 1996, pp. 2148-2157. T.J. GILL and A.L. BARTOS, "An Acousto-Ultrasonic Platform for the Quality Assessment of Thick Radial Ply Composite Structures ", Nondestructive Characterization of Materials VI, R.E. Green, Jr., et al., eds., Plenum Press (1994). D.D. SHEPARD and K. R. SMITH, "Ultrasonic cure monitoring of advanced composites", 42nd International SAMPE Symposium , May 4-8, 1997.